Aficionados of British daytime telly will be familiar with that classic staple of the cosy ITV mystery genre, Midsomer Murders (or “Midsomer Massacres” as the late great Terry Wogan termed it). Set in a fictional Home County with an abundance of country lanes and parochial houses and a remarkable absence of people of colour (intentionally so, according to the show’s promptly-sacked creator) where the well-to-do and assorted middle class ne’er-do-wells often fall prey to ludicrously elaborate and comical killings, leading to this portion of apparently genteel countryside having a higher rate of violent death than the rest of the UK combined. The crucial fulcrum around which this madness orbits is the affable Inspector Barnaby, played by John Nettles of Bergerac fame, who doesn’t so much solve the mystery as be the last man standing amidst the fallout. He was apparently replaced in later series by some other dude, but the show is rerun so often on ITV3 that the concept of chronological progression is kind of academic when it comes to watching the thing, which I suppose is rather the point of it – it takes place in a world where progress is for ruffian townies and the inhabitants would rather not be soiled with such vulgarity. They prefer more rarefied activities, such as execution via catapult-launched wine bottles. Even by the standards of the fireside Agatha Christie clue-puzzler, murder has never felt so nauseatingly SAFE. So naturally, when it came to creating the law enforcement foil which Nancy has to fight almost as much as the quantum monstrosities she faces on a daily basis, I wanted someone who the reader would feel sorry for seeing dumped in the middle of all this reality-warping insanity. My mind immediately leapt to poor baffled Inspector Barnaby, lost not just in non-relativistic space but in London as well, airdropped in the heart of the metropole with nowt but a tube map for guidance. 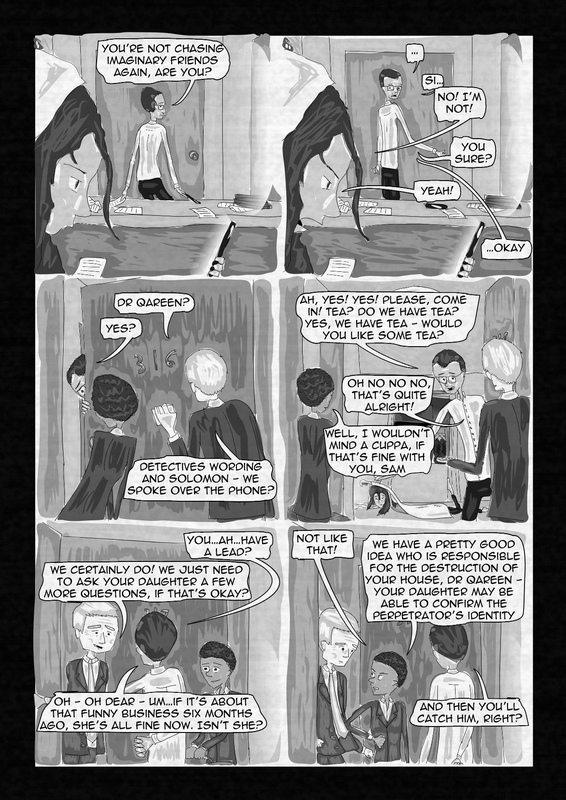 And so we meet Detective Inspector Sam Wording for the first time in this comic, seeing into Nancy’s world from the outside and weirdly determined to make it all go away so it can be replaced by a nicer world where he can enjoy his tea without being interrupted by things randomly exploding. Every policeman needs a partner, and fortunately Wording is accompanied by the much more savvy and with-it Detective Superintendent Denise Solomon, the conscience of the group who finds herself playing babysitter as much as solving crimes, and Detective Superintendent Lewis Russell, the team’s gregarious wildcard. Together they are dedicated to bringing Nancy to justice for…whatever it is she’s been doing. They’re not sure what she’s been up to, but it can’t possibly be legal.